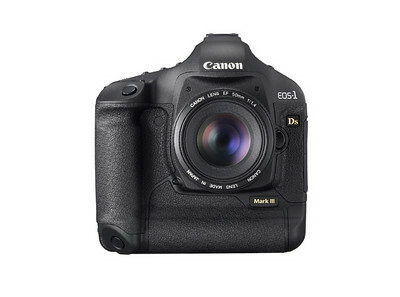 This page is dedicated to Canon 1Ds Mark III reviews and other resources. As the reviews come rolling in, I’ll post links to them below. In the mean time, you can keep an eye on the Canon 1Ds Mark III’s availability at Amazon.com, or check on other vendors like Adorama and B&H Photo on this page. It is undeniably impressive, and though it appears on the surface to be a fairly low key update to the Mark II, the more you use it the more you realize how all the little improvements add up to a significantly better camera (and that’s aside from the resolution hike). The Canon 1Ds Mk III is a solid brick of a camera, has extraordinarily high technical image quality, but is hindered by sucky ergonomics and a mediocre LCD. Canon started from scratch with the Mark III. And that is obvious with the Canon EOS-1Ds Mark III. It is much more than a Mark II with a new image sensor. There has been thorough thought about the whole camera and the entire structure has been altered without making the photographer used to working with a Canon EOS-1 lose his way. The EOS 1Ds Mark III is a remarkable display of engineering prowess. Do you need a weatherproofed camera that is strong enough to drive nails while producing the world’s best image quality? If so, the 1Ds is a bargain. If not, the Canon EOS 5D, $2150 (buy from Amazon) is a better value. The 1Ds Mark III can capture beautiful, amazingly detailed images. Colors are extremely accurate and, as mentioned above, the automatic white balance system does a great job of keeping color neutral across a wide range of lighting. Color accuracy on the 1Ds Mark III also lands in the top tier, with an Excellent rating based on an average Delta E of 6.98 (compared with 7.3 on the 1D Mark III and 7.28 on the Nikon D3, also Excellent ratings.) The color accuracy remained similarly high all the way up through ISO 1600, while resolution dropped only 15 percent when we applied full noise reduction at ISO 1600 and 3200 in Canon’s sophisticated (and included) Digital Photo Professional software. I could show you examples to make either of the two 1-series bodies appear to be slightly better than the other. If you plan for the 1Ds III and 1Ds II have a similar amount of noise, you will not be disappointed. Up to and including ISO 400, they are about the same. Above ISO 400, the 1Ds III more frequently begins taking a very slight lead (less noise) and this lead increases to slight at ISO 3200. After shooting with the camera with a few days under numerous conditions I can confidently say the Canon 1Ds Mark III is easily the most versatile full frame digital SLR currently available. Currently the only thing similar on the market is the camera it’s replacing. The 1Ds Mark II. In terms of pure image resolution the only cameras that come close are digital medium format bodies and backs. I’ve used a range of PhaseOne backs now and I know they can squeeze out more detail. That said you lose a lot of flexibility for that gain in resolution and in price point. As for overall image quality, I’ve only done about 400 frames so far shooting fall colour in Algonquin Park. I’ve made about a half dozen 20X30″ prints on the new Epson 11880 printer, and the results are generally excellent. Auto white balance is as good as I’ve ever seen. Tonal renditions are excellent, and it appears that the 14 bit processing capability is of definite value, especially when working on files which require some extensive manipulation. Catch some video footage of the Canon 1Ds Mark III via YouTube. The Canon 1Ds Mark III white paper (.pdf). The official Canon 1Ds Mark III page with specs, features and sample images taken by the new flagship. The official Canon Press Release for the 1Ds Mark III. WHEN WILL AN UPDATE IN MEGAPIXELS OF THE REBEL CANON T2 COMING SOON ?